TODAY IS THE PERFECT DAY FOR YOUR BIRTHDAY! We have super duper packages to choose from, so please see what fits your budget and needs and call us to reserve your special day! You are welcome to fill out the “Birthday Party” request form and we will get backs super fast! We appreciate your business and you have a wonderful time at Flippers Arcade!!! 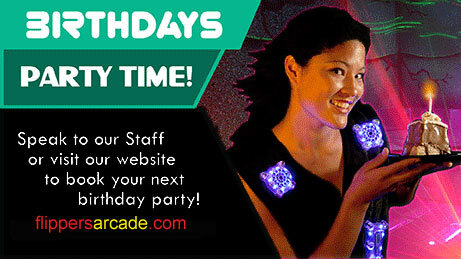 Ask about adding laser tag to your party package! We appreciate your business and hope you have a wonderful Time!